If you've fired up the Destiny 2 beta only to be left wondering where the new social hub The Farm is, don't worry. You're not missing it, it's just not live yet. In fact, Bungie won't be giving Guardians access until 10am Pacific/6pm BST on the final day of the Destiny 2 beta test, July 23. You'll need to hurry if you want to enjoy the sights and sounds (and fortunately not the smells) of The Farm, since it'll only be live for one hour. If the version going live in the beta is anything like the final version, there will be two vendors - a Postmaster and a Cryptarch - as well as a field where you can play a scored game of soccer with a giant-size ball. There may also be ways to draw extra attention to your Guardian via secret activities hidden around The Farm, but Bungie is obviously being quiet on those. So maybe practice your soccer skills ahead of time and put on some armor you don't mind getting dirty, because you're gonna want to squeeze in as much farm activity as you can in those 60 minutes. Want some tips to help you through the beta's campaign mission, Strike, and PvP? 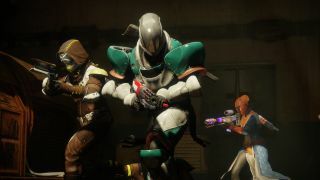 Check out our Destiny 2 beta guide. We've also got a list of Destiny 2 beta reactions so you know you're not alone in hating those Super cooldowns.